Getting charged by a female orangutan, being with Dr. Birute Galdikas for 2 days and seeing and interacting with orangutans in their native habitat was the highlight of “Faces in the Forest” from Singapore to Bali, with stops in Borneo. 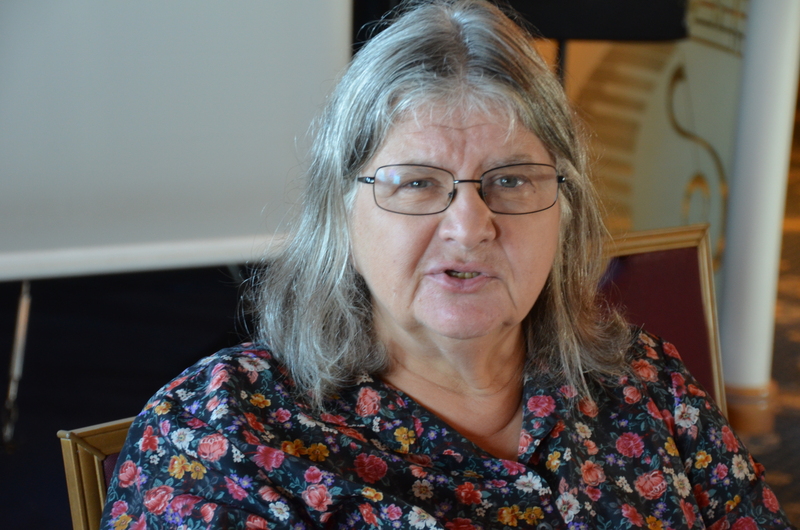 Having the founder of Camp Leakey, Dr. Birute Galdikas, join us in Borneo’s Camp Leakey near Tanjung Puting National Park to show and tell us about her experiences and why she started Camp Leakey and loves orangutans. Priceless. Getting to hold an infant orangutan in diapers and teenager in my arms at the Orangutan Care Center in Camp Leaky near Tanjung Putting National Park while Dr. Galdikas told us each one’s name and individual rescue story. Beyond Priceless and a dream come true. 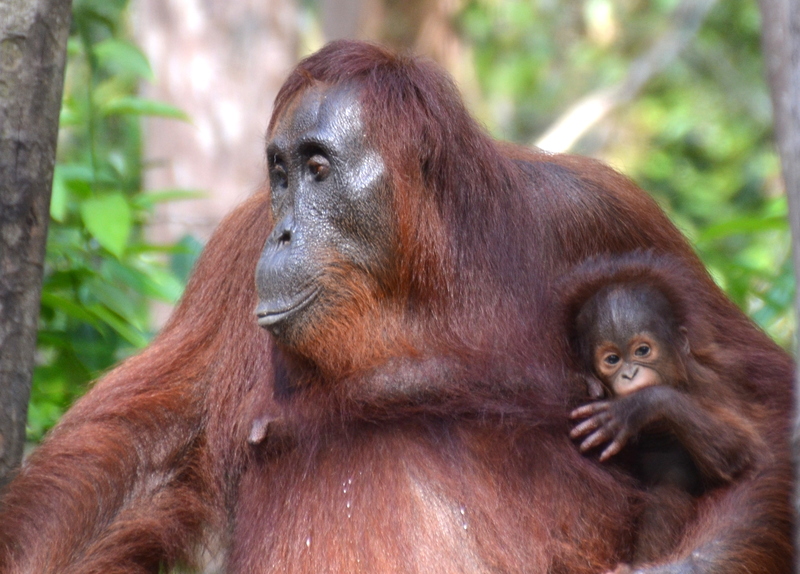 Momma and Baby at Camp Leakey. Learning that The Orangutan Foundation International (OFI), the non-profit organization that funds the Orangutan Care Center (OCC) wants to buy more pristine forest land next to the OCC because they do not have enough forest for the orphaned and rescued orangutans to live in their wild habitat. Learning that any one can donate any amount of money to the The Orangutan Foundation International (www.orangutan.org) to help make the goal of buying more natural forest adjacent to the Orangutan Care Center and that in the USA it is a 5013c tax deductible donation. 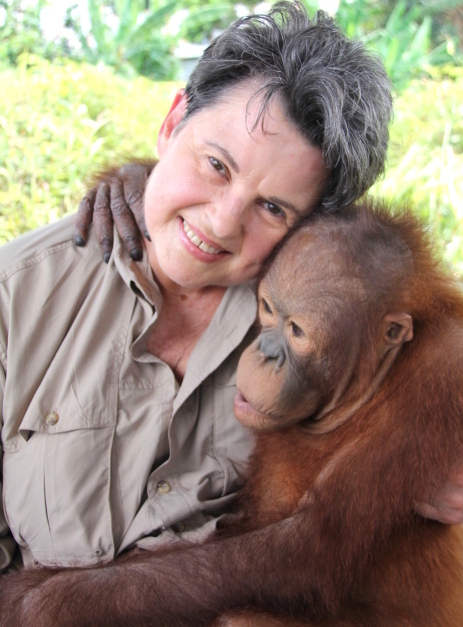 Learning that Dr. Galdikas, president of OFI, has studied orangutans longer than any other person in human history and has worked ceaselessly to save orangutans and forests, and to bring orangutans and their loss of the rainforest plight to the attention of the world. Enjoying every minute with the orangutans and proboscis monkeys in the Singapore Zoo while (now owned by National Geographic) Orion was boarding 78 new passengers for the Singapore/Borneo/Bali segment. Going for a second time to Semenggoh Rehabilitation Center in a medium heavy rain and walking into the rainforest to photograph 4 orangutans that had come for a morning snack and then leaving the rain forest to go to another viewing platform when Hot Mamma and her baby and 2 other orangutans came to eat their snack, giving us another “greatest show on earth”. AWESOME. Seeing Big Momma and her baby kissing and another baby yawning at Semenggoh Rehab Center in the pouring rain and capturing the second it happened in a photo. Priceless. Learning the many terms and uses for palm tree oil in a speech called “The Good Oil? ?” Unbelievable. Enjoying Trivia everyday at 4:30 pm on the (National Geographic) Orion expedition ship and hearing the MC from France jokingly take points away from teams that didn’t agree with the answer, argued, or questioned him. So much fun and a laughing good time. Snorkeling in Tanjung Lintang and Tanjung Seitah, two islands in the South China Sea between Borneo and Singapore, then having a BBQ Dinner on the beach. Arriving at each “port” by getting in a 10-person rubber raft boat called a Zodiac that was rocking back and forth 12 inches up and 12 inches down then sideways up and down then traveling to shore for 15-45 minutes at 15 knots while sitting on the Zodiac edge holding on for dear life as it regularly slammed into and over waves all the way to shore, only to walk in water or muddy mud/sand for 15 to 150 feet to shore. Adventure to the max. Momma and Baby kissing in the rain. 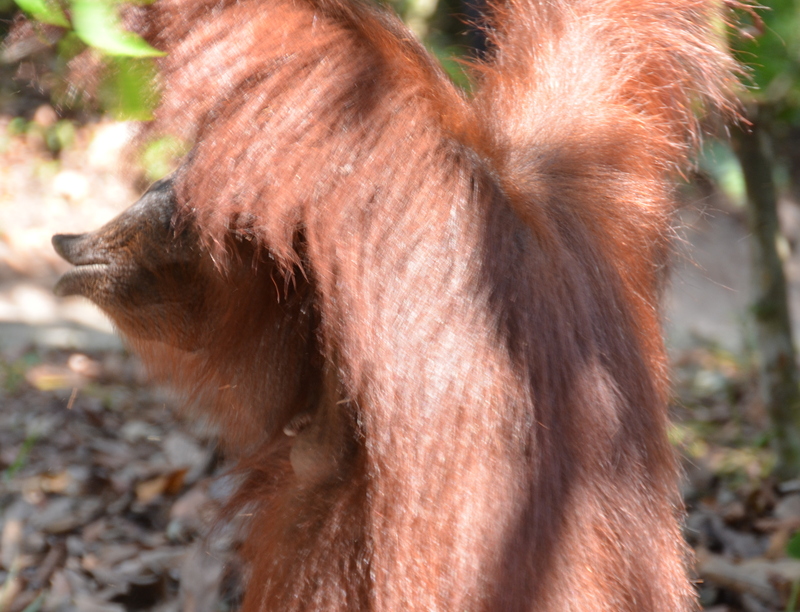 Learning that orangutans are considered the smartest of the great apes and they have great patience. Having a wonderful lunch of hamburger, French fries, coke and banana split in Singapore, compliments of (National Geographic) Orion. Enjoying every minute with the orangutans and proboscis monkeys in the Singapore Zoo while the (National Geographic) Orion was boarding new passengers on the next segment, Singapore to Bali. Having 78 new passengers on “Faces in the Forest” segment to Bali on the (National Geographic) Orion, with 8 “stowaways” as we were called along with 6 others, from the previous “Rajahs, Riches and Rainforests” cruise from Kota Kinabalu. Snorkeling on Tanjung Lintang and not being able to see the mountain next door because of the heavy smoke from the burning forests in Borneo. Absolutely and totally enjoying “Faces in the Forest” segment of (National Geographic) Orion Borneo cruise with 75 crew members from the Philippines who gave excellent service, and 86 enjoyable passengers from the USA, Australia, Indonesia, New Zealand, Philippines, Germany, UK, Italy, The Netherlands, Norway and Peru. Having lunch on the (National Geographic) Orion and meeting a couple from New Zealand, Julie and Mel, plus a couple from Indonesia and Australia, Bob and Yanti, and discussing our travels and travel stories. Absolutely fabulous. Going to Tanjung Puting National Park in Kalimantan, Indonesia, on the island of Borneo, my #143 country to visit. 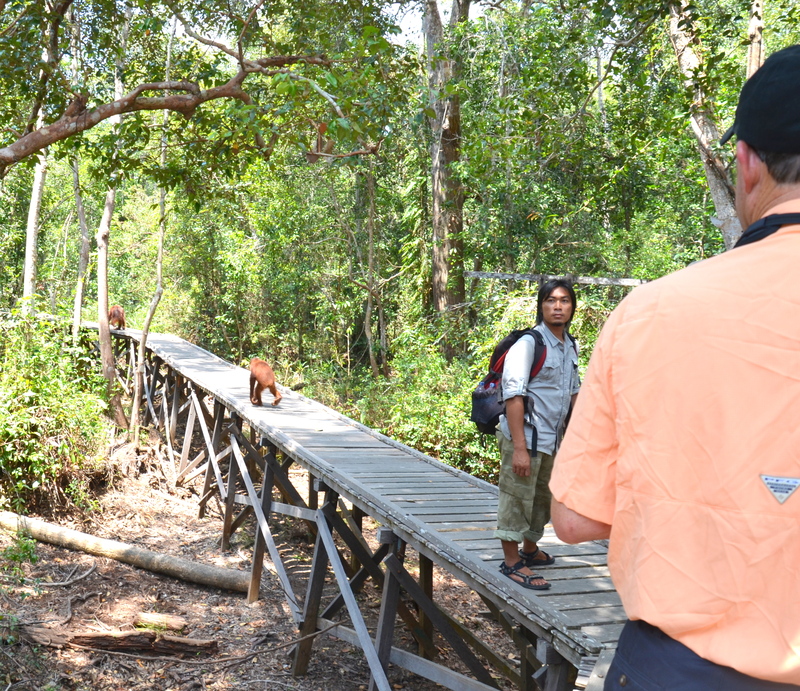 Leaving Camp Leakey and Tanjung Puting National Park in a klotok. Losing my new camera and not missing it until the following day and (National Geographic) Orion Reception manager saying it had not been found, only to get a phone call 5 minutes later saying it had been found because it was labeled with my name. Priceless, Priceless, Priceless. Learning that humans can have a blood transfusion from chimpanzees that have almost 99% DNA as humans, depending on blood type and that they have the strength of 5 humans. 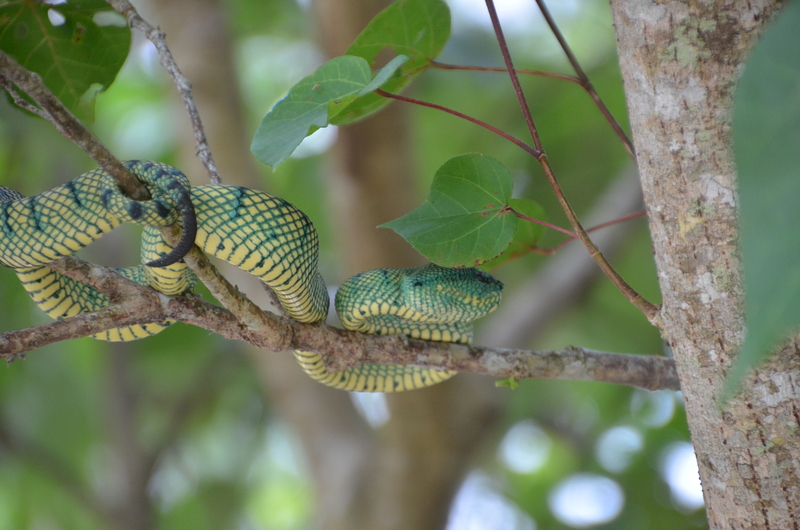 Visiting Bako National Park for the second time in one week in Sarawak on the island of Borneo and seeing a Pit Viper, all green and waiting in a tree for prey to come, Macaque monkeys, one with a baby, and proboscis monkeys. Fun. Seeing the heavy smoked terrain from the middle central of Borneo all the way south and west to Singapore and not getting to see the true color of everything due to the burning of the forest’s wood to make way for palm tree plantations. Palm oil and its products are used in processed foods around the world. 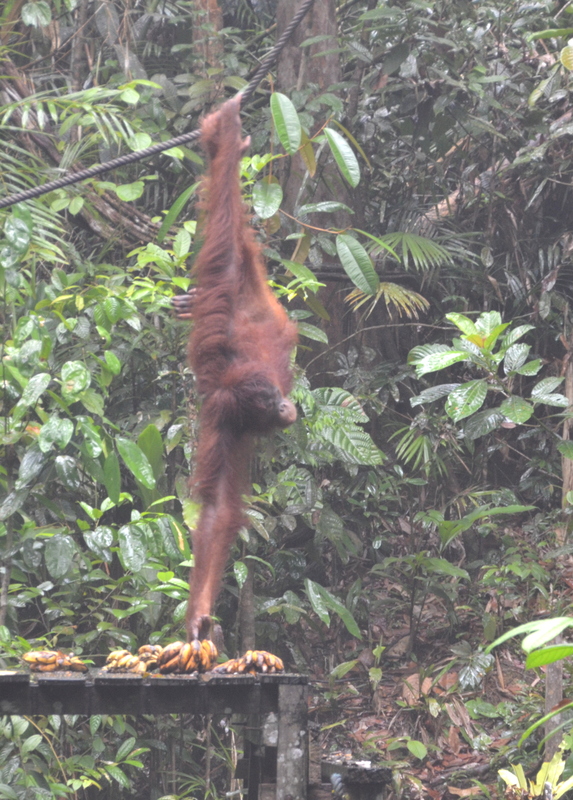 Watching orangutans come down from the rainforest in the rain to the platform via ropes to grab a dozen bananas at a time and carrying them any way possible with their feet to their mouth and returning up the rope to a safe place on the nearest tree to enjoy their morning snack. Grab and Go in Semenggoh in the rain. Learning that Kuching, Sarawak, Malaysia on the island of Borneo is known as the city of Hornbills, only to learn there are no Hornbills now because the trees in the rainforest where they lived have been cut down to make way for palm oil plantations and developments. Learning that Hornbills are the #1 keystone fauna in importance, because if Hornbills go, everything else goes because Hornbills spread the seeds that keep flora and fauna going. Learning that “Borneo” resulted in an Anglicized version of “Brunei”, which used to occupy the entire island of Borneo until Brunei gave part of its kingdom to Malaysia and Indonesia, saving enough land for the current Kingdom of Brunei Darussalem which luckily contained the vast oil reserves. Learning that gorilla’s DNA is 98% like humans and they have the strength of 6 humans. Learning that Kalimantan, the southern section of Borneo owned by Indonesia where Tanjung Puting National Park is located, means “river of gems” or “river of diamonds” which are found in abundance in some areas. 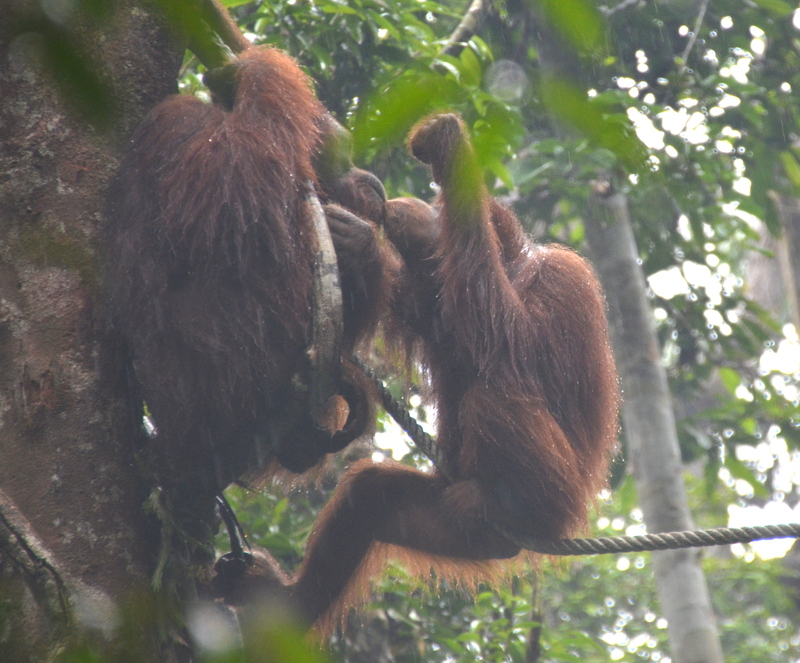 Learning that Orangutans are perfectly at ease being solitary or semi-solitary and do not need constant social reassurance, nor do they fear being along or lonely, the opposite of other great apes and humans. Learning from Fred Galdikas, Dr. Birute Galdikas’s son, who was born and raised in Camp Leakey, about his Mother’s Orangutan research, how he was raised with the orangutans and other children in the camp, and how the orangutans taught him to climb a tree. Learning that Camp Leakey has 340 orangutans led by Tom, the 300+ pound dominant male orangutan. 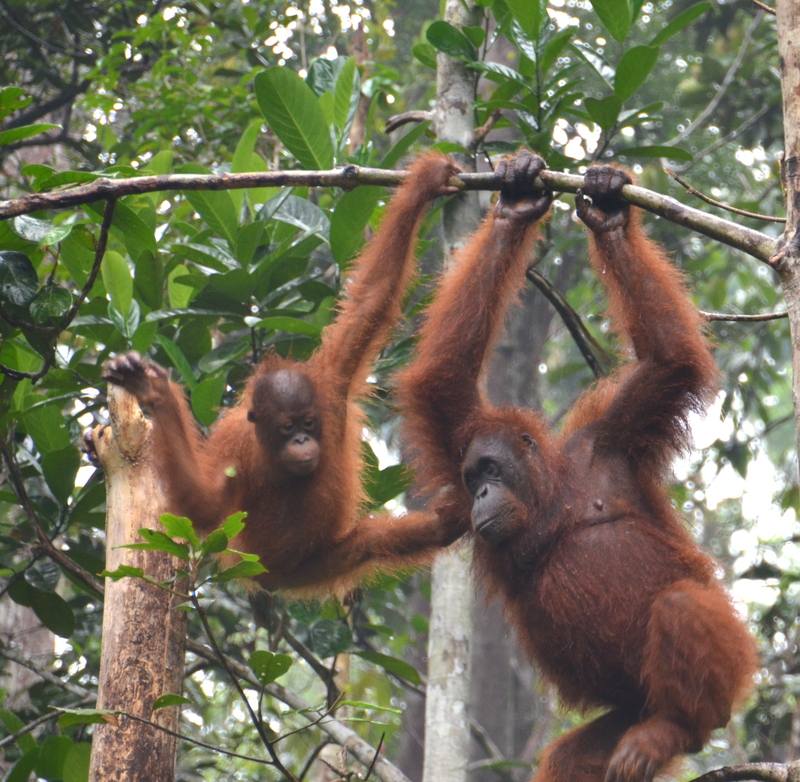 Learning that the Orangutan Care Center, established in 1998, has 60 orphaned and rescued infants and teenagers. Being told when visiting Camp Leakey, the only place left in Borneo to see wild orangutans, to let the orangutans come voluntarily to us, and don’t fight back if they grab us or our possessions because a ranger will come and help. Mooch showing us she is boss. Learning the difference between monkeys and apes–monkeys have tails and apes don’t. Learning that New World Primates are from South America and that Old World Apes are from Africa and Asia. Holding a baby orangutan that did not smell, was heavy, hot, strong and loving. An unbelievable dream come true. My baby boy was so loving. 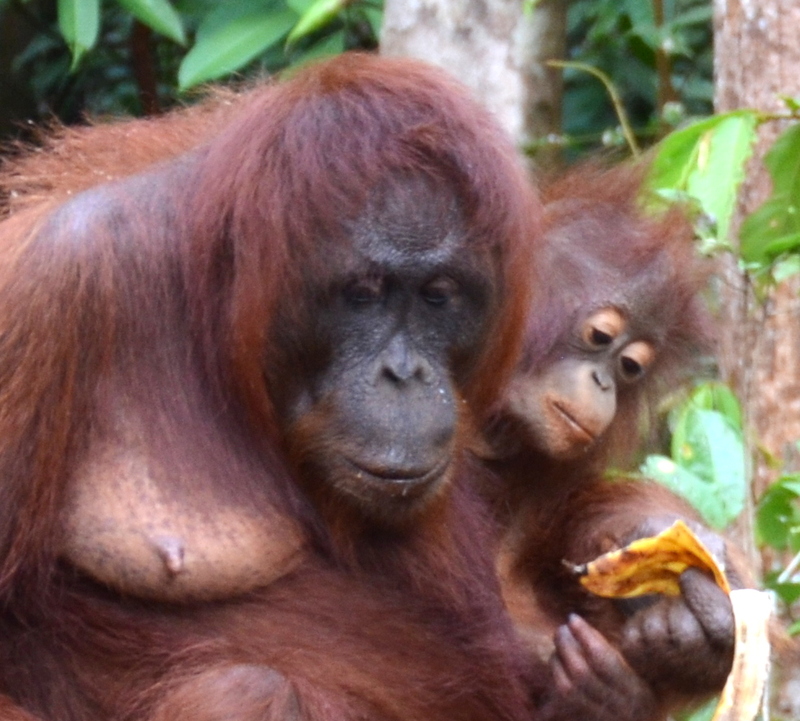 Watching a mother and baby orangutan bury their heads together in a box of milk supplement thereby causing their behinds to be up in the air while drinking. So funny. Enjoying the hugs from 12 infant orangutans at the Orangutan Care Center (OCC). Ranking the Orangutan Care Center, where we fell in love with 12 infants and Dr. Galdikas, the best part of the trip. 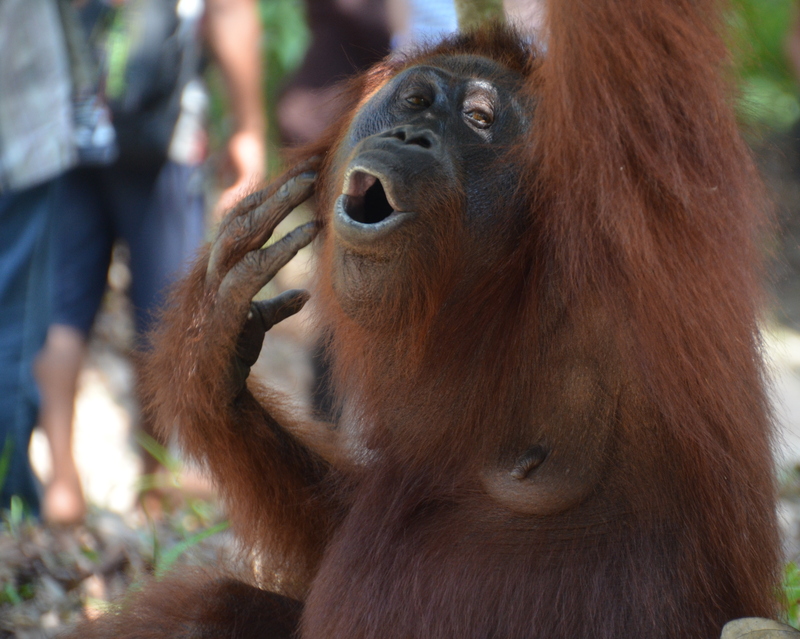 Getting charged by Mooch, a 25 year-old female orangutan while sitting on a bench at Camp Leakey “because I exuded confidence and therefore I was in her territory,” according to Dr. Birute Galdikas. Priceless. Being shown the way to the snack platform in Camp Leakey. Being met at the Camp Leakey dock by Mooch the orangutan and then being led into the camp by a mother and baby orangutan. Amazing and so much fun. 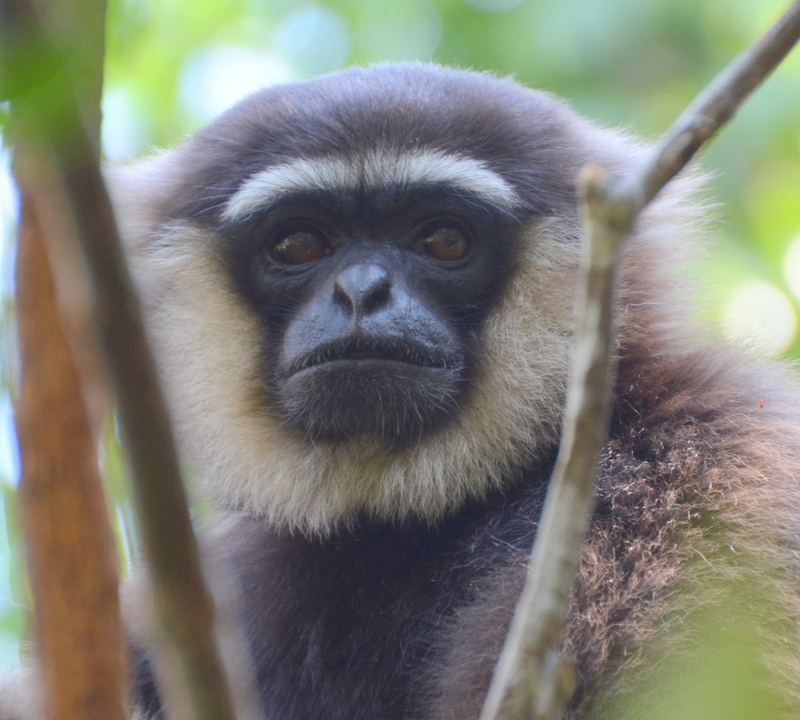 Seeing a beautiful black and white gibbon ape at Camp Leakey doing acrobatics. Seeing the orangutan hospital at the Orangutan Care Center, learning how they operate on, do tests on and care for sick orangutans and seeing inside an orangutan vet’s office. 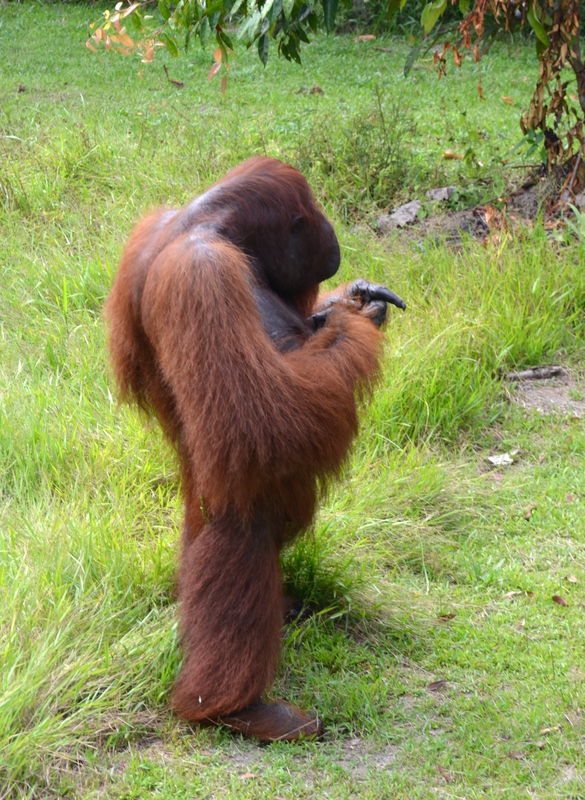 Learning that inside an orangutan’s body is exactly the same as a human’s body. Seeing a tree full of 15 to 20 Proboscis monkeys, each sitting on a separate limb like Christmas lights, while gliding in a klotok back to the (National Geographic) Orion at dusk. Absolutely awesome. 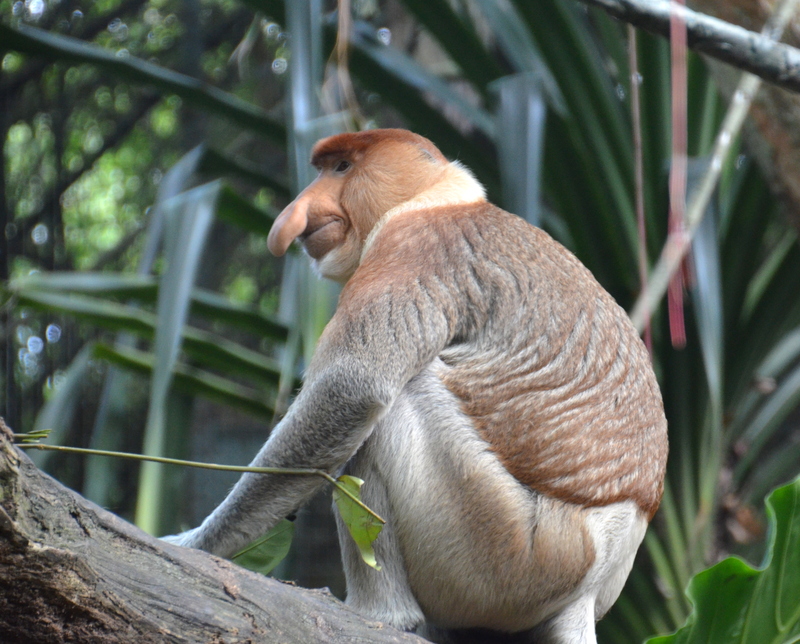 Having one second to take a photo of those 15-20 proboscis monkeys sitting in a tree. A beautiful photo. 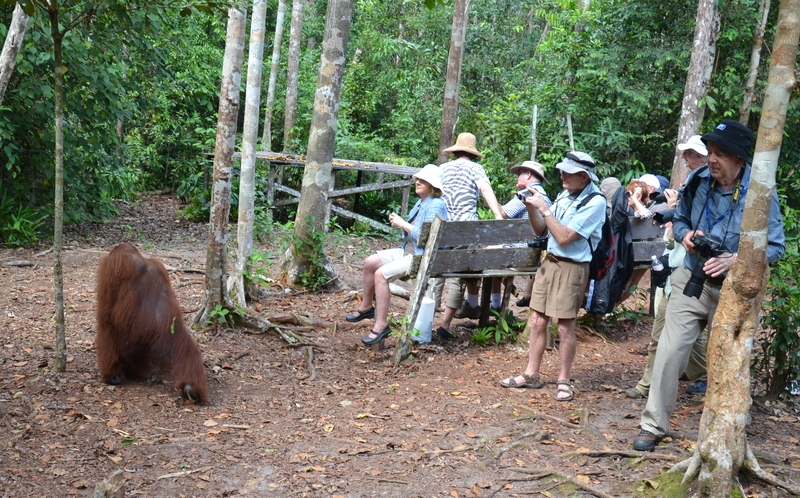 Having the orangutans walk freely among us at Camp Leakey and they were fun, not dangerous. Such an unexpected treat. Camp Leakey is his home. Having Erin surprisingly jump into Tom’s arms because “Erin doesn’t have anything to do with people” Dr. Galdikas said. Riding in a klotok, with kitchen, toilet and main room, at 5 miles per hour down the Black River to Camp Leaky eating lunch prepared by the (National Geographic) Orion exploration ship. Totally enjoyable. 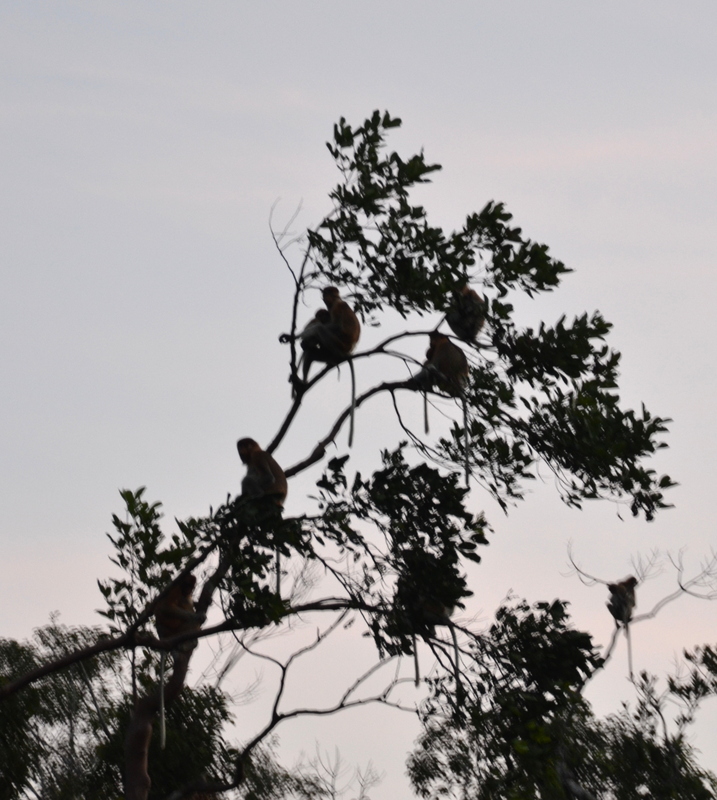 Seeing many trees with Proboscis monkeys at dusk sitting in trees eating with their babies nearby. 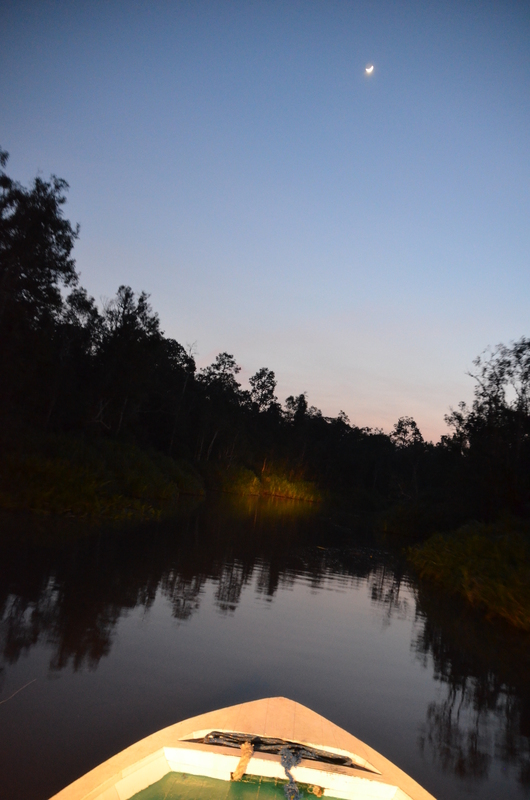 Gliding down the Black River and Semanyer River in a klotok at night with the quarter moon and stars putting a fabulous glow on the water. Beautiful. Enjoying the slow, smooth, easy gliding klotok, making it hard to stay awake to look for orangutans and proboscis monkeys. Meeting a lovely couple on the Singapore to Bali segment, Bob and Yanti from Jakarta, Indonesia, on the island of Java, and being invited to enjoy their private tour of Jakarta, making my #144th country/entity to visit in the world. Outstanding. Ending the “dream of a lifetime” (National Geographic) Orion exploration experience in Bali and being told “Goodbye” by Dr. Birute Galdikas with a “Thank You” hug and then kiss on the check. Beyond Priceless. Seeing the smoke from Borneo all the way inside Singapore from the burning forest trees to make way for the many palm oil plantations..
Learning that Borneo is the third largest island (after Greenland and Papua New Guinea) in the world and that Sumatra and Borneo are the only 2 places in the world where orangutans remain and their habitat is being destroyed by the minute for palm oil plantations. Learning that it is projected that orangutans will no longer exist in the wild by 2022. Learning that it takes $1200 USD a year to maintain an infant/baby orangutan at the Orangutan Care Cener and that there are 360 of them being raised and cared for at the OCC now. Learning that the best things one can do in the rainforet is to use a flashlight when dark as it alerts the animals, cobras, etc. to avoid that area or that light. Learning that it is feast or famine at the Orangutan Care Center because the fruits in the rainforest are seasonal, making it necessary to supplement feed. Learning from Dr. Galdikas that the orangutans constantly are active removing locks, handles, latches, and breaking doors and windows on her house at Camp Leakey. Plus, she said they figure out how things operate and are smart about mechanics. Learning from Dr. Galdikas that the orangutans at Camp Leakey figure out when she is coming by the sound of her boat and where it docks, by the behavior of her assistants getting things in order for her arrival, and if she doesn’t stay the night in her house they know she will be back the next day. Learning that Dr. Galdikas works with students from all over the world who come to study orangutans just like she has done since she was 25 years old in Camp Leakey, Borneo. Observing that every orangutan mother I saw carried and held her baby under her left arm and used her free right arm and hand for eating food and doing whatever she needed to do.Amazing.